“Hello?” A twenty something-ish female voice answered. “Um, hi. Is Chris there?” My voice trembled and it was hard for me to hold my phone up to my ear because my hands shook so badly. I could hear dogs barking in the background. My brother had dogs. Another piece of information I had learned about him today. The dogs sounded like they were big, I wondered what kind he had. “Yes, who’s calling?” I was curious to know if I had just spoken to my brother’s wife. “My name is Darla and I’m looking for my brother, Chris.” I said it all in one breath and I spoke really fast. I heard more dogs barking. Something was said to the male voice in the background. Someone cleared their throat and the phone was passed over. “My name is Darla. Uhh, I think I’m your sister and, umm, you might be my brother. Umm, I think we have the same Dad, Dennis.” And then there was complete silence. What seemed liked eons was probably more like 2 seconds. Once the words came out of my mouth I realized I just sounded like a gigantic dork. I’ve been waiting for this moment for years and had rehearsed everything I would say in my head a thousand times. It was going to be beautiful and meaningful. I imagined it would be as eloquent as a Hallmark card, but this was me we were talking about. Those thoughts from my imagination had evaporated and everything I imagined I’d say was gone. Years! The years of manifesting that moment, and I bombed. I managed to get the words out, just not the ones I had rehearsed. I finally exhaled. I hadn’t realized it, but I’d been holding my breath. Breath, Darla, remember to breath! I took another deep breath, searched for some words. My major brain fart was leaving me speechless. I was holding my breath again and bracing myself for rejection. It had been 25 years since he’d last seen us; I had no idea how he felt about our dad, me, or the rest of the family. I had no idea if even remembered me for that matter. I didn’t know the stories he was told or what he believed to be true. My biggest fear was that I would say the wrong thing and ruin any chance our dad had at having his kids back. I wanted, more than anything, for our family to have the opportunity to be together again. “I was just talking to my wife about finding you guys. I told her that I thought it was time we did.” As I heard him speak those words, tears filled brimmed my eyes. I’m not sure if the tears were those of relief hearing that Chris wanted to be a part of lives or if it was happiness knowing my dad’s heart could finally be mended. It could’ve been the excitement that this 4 year journey had finally manifested and I was overwhelmed with the fact that our family would finally be complete. Maybe it was the realization that God is good all the time and He always answered my prayers. After we lost Machaela, I felt like He didn’t care about me. I felt abandoned by Him and I was angry about it. I didn’t think He was listening to my prayers and if he was, he certainly wasn’t doing anything about it. This day brought confirmation that God did care about me, He did answer my prayers, it just wasn’t always the answer I was hoping for. On this day, I knew without a shadow of a doubt that my God loved me, never stopped loving me and will always love me. Our conversation lasted for a solid two hours. It flowed effortlessly as we talked about everything from our love of flip-flops, carne asada and 4×4’ing. The similarities in our interests were astounding. It was amazing to see the parallel of lifestyles we lived despite being thousands of miles apart. It attested to me that genes do, indeed, run deep. We also talked about Dani and her son, Nick. We decided it would be best if Chris was the one to call Dani and let her know that we were looking for her. I agreed, figuring he’d know best. I prayed ferociously for the next 24 hours that she’d be as welcoming and open to meeting us as Chris was. I knew in my soul she would. Once the conversation ended, I called my mom to confirm what she had been hoping for. My dad was still in Samoa and had no idea that any of this was even going on. We decided not to tell him until his plane landed. Boy, he was in for a surprise! The following week, I had to pick up Dad from LAX late in the evening. My mom and I drove in my 4×4 pickup truck; I was speeding and as usual, she was yelling at me for it. But dang dude! I was anxious! I had taped a recent picture of Chris and Dani to my glove box, had a voicemail from Chris to my Dad stored in my phone and couldn’t wait to see the look on Dad’s face when I told him the news. We had decided to park and walk to the terminal to find him. Even at this time of night, traffic at LAX was crazy. There he was. Smiling and waving at us as we walked across the street. He was waiting for us outside the terminal, standing at the curb. He walked up to my mom and planted a giant kiss on her. I smiled, because my parents are one of the few couples I know, still married, and still kiss each other like they mean it. We got back to my truck and my dad threw his luggage in the bed, my mom hopped into the extra cab with my dad in the passenger seat. “Who’s that?” Dad’s eyebrows were raised and his eyes were squinted as he pointed at the picture on my glove box. “Who does it look like?” I couldn’t help but smile. “Kind of like Uncle Doug combined with Duane.” Doug is my dad’s brother. “Do you think maybe he looks like you?” Silence. In that instant, he knew exactly who these people were taped to my glove box. “Is it?” was all he said. I smiled and simply shook my head yes. What my dad didn’t know was that we had made airline reservations for Chris and his wife, Rachel, to fly out the afternoon after our dad’s arrival home. I was super bummed that Dani and Nick wouldn’t be able to come out until Nick’s spring break. Coincidently, we had been planning a huge surprise party for my dad’s 55th birthday for later in the week. Most of our family would be coming and so would many of my parent’s closest friends. To add to the element of ‘surprise’, we decided to keep it a secret from everyone that Chris and Dani had been found. There were surprises left and right! It was arrival day for Chris and Rachel! 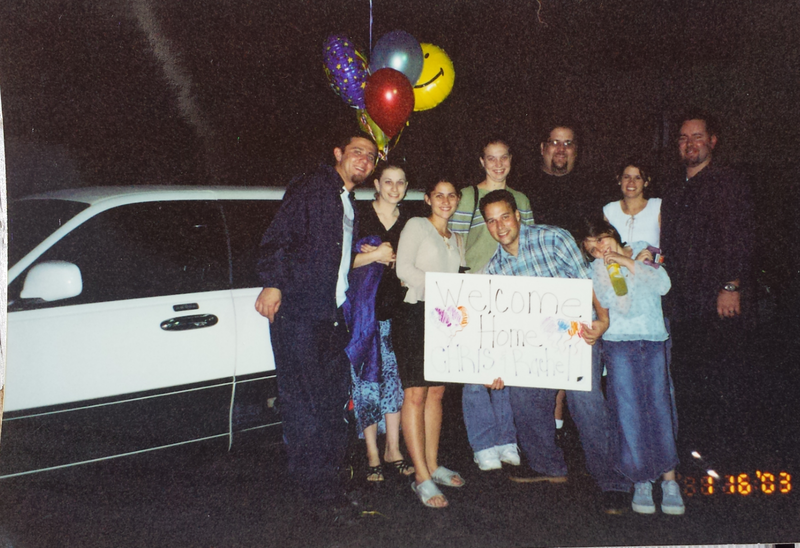 Myself, Jim, my sister, Kim, her hubby, Revo, my niece, Kaitlyn and my little brother Duane and his wife, Vanessa all crammed into the limo we rented along with a dozen or so balloons and a huge “Welcome Home” sign. This was the 800 US search commercial I had been praying for and it was going to be perfect. We arrived at LAX and anxiously waited for them at the terminal. My insides were quivering from a mixture of excitement and nervousness. I think all of us were feeling the same way. I couldn’t imagine what Chris was feeling. At least I knew the family we were in. He was walking blindly into a reunion with a bunch of people he hadn’t seen since he was a child. Whatever I was feeling must’ve been considerably small compared to what he was experiencing. “There he is!” Kim screamed! She instantly recognized him and shot after him like a bolt of lightning. He was heading down the escalator, his wife’s arm intertwined with his, with a great big smile beaming across his face. The balloons and signs grabbed their attention immediately. As soon as they were off of the escalator, we all ran towards them. Kim was already there and had her arms wrapped around him, giving him a giant bear hug. We all hugged, made introductions and looked at each other, examining the similarities. We posed for pictures and hugged some more. The passing travelers walked by us, smiling and nodding, just like in the commercials. I could not believe that this was actually happening. Wow! I couldn’t believe that God had just given us this astonishing blessing. My heart leapt for joy and I couldn’t stop smiling. All of my nervousness had vanished and I felt like I had known Chris and his wife all of my life. 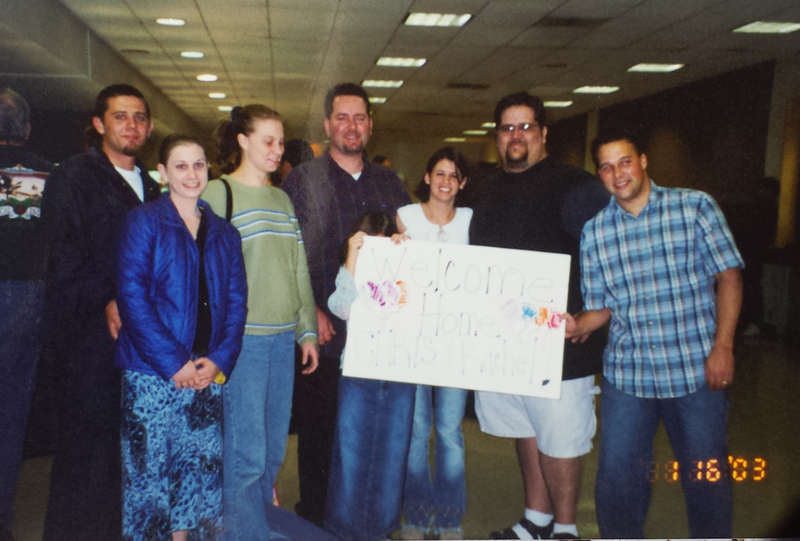 I was so excited for what the next morning would bring when Chris would actually be reunited with our dad. 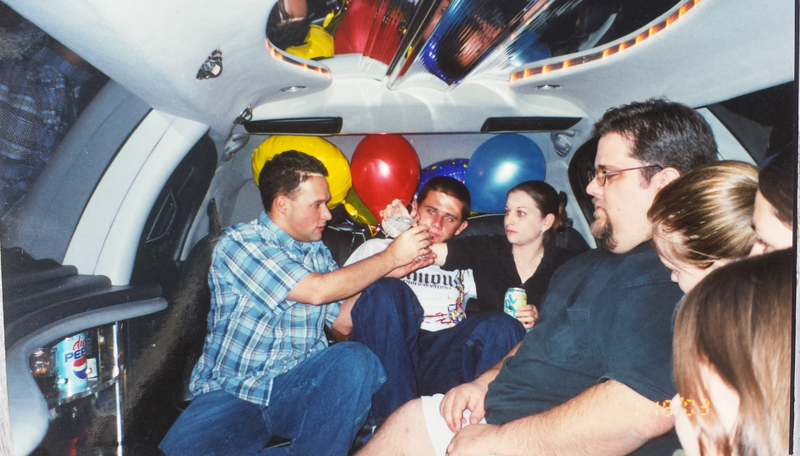 We all gathered back into the limo, chattering away as we drove back towards my house. In less than 36 hours after learning that we had found his kids, dad would be reunited and he had no idea. **Do you have a long family member or a story of a reunion? I’d love to hear about it the comments below! This entry was posted in faith, family, god, hope, reunion, Uncategorized and tagged blessing, brothers, dad, Faith, family, friends, happiness, healing, hope, love, mom, moving forward, nervousness, overcome, parenthood, prayer, rejection, reunion, searching, siblings, sisters, strength, support, triumph, wisdom, working. Bookmark the permalink. So amazing! Being reunited with my dads sister that we never knew existed, I know all of these feelings so well. Me too:) cant wait to see them in a couple of weeks!